Ever wondered where and when does Ateneo and La Salle's grudge to one another started? 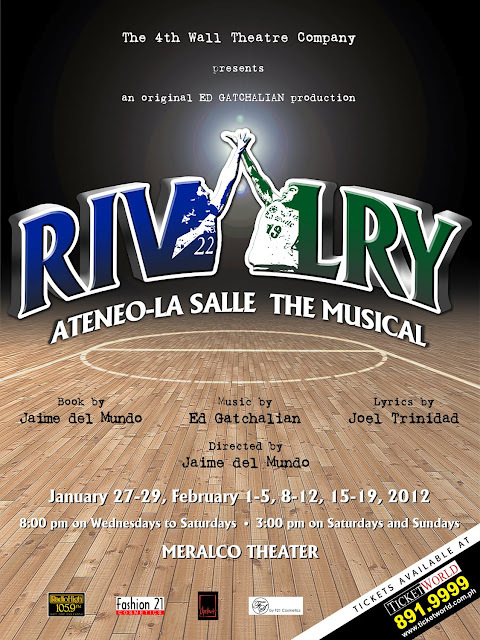 "Rivalry" (Ateneo-La Salle The Musical) - a brilliant portrayal of the competitive spirit between archrivals La Salle and Ateneo! The decades-old feud between Ateneo and La Salle has always ignited lengthy discussions and passionate debate among those of the blue and green persuasion. While the rivalry has considerably mellowed over the years, it gets renewed every time the UAAP season begins. These schools are both are private, Catholic academic centers within the Metropolitan Manila area. One is from Taft and the other one is from Katipunan. In the story, “Rivalry” revolves around two families in 1968: the Valencias with their star Atenean basketball star, Paco (O.J. Mariano); and the Basilios, with the La Salle court heartthrob Tommy. Incidentally, the two boys are actually cousins. Set in 1968, the musical produced by Ed Gatchalian, is the story of two families: the Valencias and the Basilios. Paco and Tommy are cousins, both seniors and star basketball players of Ateneo and La Salle, respectively. The competition between these two schools is as classic as the Montagues versus the Capulets, the Jets versus the Sharks, Magic Johnson versus Larry Bird, Federer versus Nadal, UP versus others. As a subplot, there’s Paco’s younger brother Quito (Felix Rivera), who asks Tommy to introduce him to a girl he fancies from Maryknoll (now Miriam College), Rina. Tommy gives his word as a La Sallite to his cousin but nonetheless finds himself falling for the girl. The stories are set against the backdrop of the NCAA championships. “Rivalry” is, at best, a work in progress. Both schools play to type in "Rivalry." Ateneo values the arts and humanities, its students speak Latin and quote the classics; La Salle, meanwhile, is all about business and numbers. While the show gets the boys right, it does Miriam College no favors by depicting Maryknollers as a gaggle of vacuous, giggling girls. “Give me a boy from La Salle, please,” they plead again and again and again. In a smart move, Mr. Trinidad throws UP a bone through a cameo by his father Noel Trinidad. Now on stage, their decades-long rivalry in basketball could extend their protracted war on the hard court to the diamond-shaped field and, by bringing fans back, effect a truly renaissance of the sport that, many years ago, was the Filipinos’ favorite. People who do not root for either team probably think this rivalry is too overrated, over-publicized and given too much attention but sad to say and we just have to admit that the Ateneo – La Salle rivalry is here to stay! Produced by The 4th Wall Theatre Company and directed by well-known theater writer/director Jaime del Mundo, "Rivalry" runs until March 11 at the Meralco Theater with 8 p.m. shows Wednesday to Saturday and 3 p.m. matinees on weekends. For some people, especially during basketball season, Ateneo-La Salle becomes a matter of life and death, but that’s why the rivalry is iconic — because students blow it so out of proportion that it becomes hilarious. This is the video of the making of "Rivalry"